PeachCare for Kids Co-Payments- Beginning April 1, 2012, a co-payment is required for the certain services in the PeachCare for Kids program for children 6 years of age and older. Almost all office sick visits for these children who are enrolled in PeachCare will be $2. PeachCare Fee for Service program implemented “cost based” co-payments for physician services; see chart below for details. However, the Medicaid CMOs have elected to apply a flat $2.00 copayment to sick visits for these PeachCare patients. PeachCare for Kids Rate Increase – On dates of services on and after April 1, 2012, physicians will receive an increase in selected Evaluation and Management (E&M) codes provided to children enrolled in Peach Care for Kids children through Medicaid Fee for Service, to 100% of the FY 2011 Medicare (Atlanta) rates. The codes impacted by this increase include: 99201, 99202, 99203, 99204, 99205, 99212, 99213, 99214, 99215, and 99217. The CMOs will implement this rate increase on 6/1/2012 and will reprocess all claims submitted with DOS 4/1/2012. In addition, please look for reprocessing to occur for FFS claims as well. Peach Care for Kids members are not required to pay more than 5% of their yearly income for premiums and co-payments. Once the family reaches the 5% limit, they will not be required to make co-payment and premium payments for the rest of the year. The MMIS eligibility system will alert providers when a member has reached the 5% max. Lastly, please note, co-payments are not required for foster children or children who are American Indians or Alaska Natives. PeachCare for Kids began covering children in 1999, providing comprehensive health care to children through the age of 18 who do not qualify for Medicaid and live in households with incomes at or below 235% of the federal poverty level. If you are aware of children who do not have health insurance, they may be eligible for coverage under this program. Families may call 1-877-427-3224 to request an application or complete the application online at www.peachcare.org. Physician’s offices may request copies of PeachCare for Kids applications by calling the toll free number as well. PeachCare for Kids requires verification of income at application and annual renewal. Eligibility is dependent on the successful completion of this documentation. 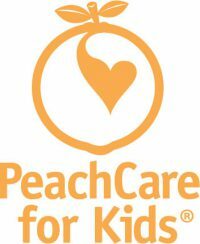 Effective 10/1/2011, state employees can apply for PeachCare for Kids. The application period has been extended to December 31, 2012; with no six month waiting period. Visit www.peachcare.org for more information on eligibility and requirements. There is no cost for children under age six. Currently, the cost per month for PeachCare for Kids coverage over age six, is $10 to $35 for one child and a maximum of $70 for two or more children living in the same household. There are no co-payments or deductibles required for benefits covered by PeachCare for Kids. If you have any questions, please call PeachCare for Kids at 1-877-427-3224. Spanish speaking families can apply online in their native language. Information on PeachCare for Kids in Spanish is accessible at www.peachcare.org. Peach Care for Kids members are subject to a three-month waiting period for eligibility coverage if their premiums are not received by the 1st of the following month. January 7th – If premium is not received, letter is sent reminding parent that premium is due no later than January 31st for February 1st coverage. January 31st – Payment not received. Child’s Eligibility is ended effective February 1st. May 1st – Earliest child’s coverage could be reinstated. Parent would have to send premium payment by April 1st. Also note, the waiting period for PeachCare for Kids coverage for parents who voluntarily terminate coverage of private insurance is six months. Members log onto the password protected “my account” of www.peachcare.org to view their account information, pay premiums, update their contact information, check the status of premium payments and verify monthly payments. Members can also use their credit or debit cards for payment by calling (877) 427-3224.